I only finished this on the second of January but started this at beginning of December so TECHNICALLY, this is a 2018 read. But as I finished this is 2019, am classing this as my first 2019 listen! And what a why to start my reading year off! 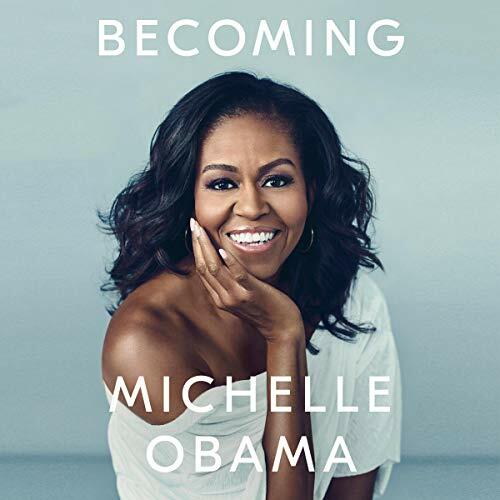 Becoming is Michelle Obama memoir about her becoming the woman she is today. Becoming herself while growing up on the South Side of Chicago, becoming a lawyer, becoming a wife, becoming a mother, becoming the First Lady of the United States - the first African American to do so, becoming an advocate to young girls and women everywhere. I really admire and respect Michelle Obama and as soon as I could preorder this audiobook (read by herself), I did so without a moment’s thought. And though I couldn’t start listening to this as soon as it was ready for download, I listened a little slower than I would like (due to business/quietness at work and basic real life stuff) but enjoyed listening to Michelle speak openly about her life. I am going to admire that this might not be everyone’s cup of tea. I fully accept this, but I really liked this. I thought it was interesting and insightful to her Michelle be honest about aspect of her life before meeting Barack, getting married to him, having marriage counselling and having IVF, talking about running for White House and everything else. I thought it showed something more. I’m not even sure why am writing this on the Pewter Wolf as every review I have read on Audible, Goodreads and all bookshops screams five stars so we’re all on the same page but I hugely enjoyed this and I think you might to. I am going to, once I have funds, get a physical copy of the book and put on my shelves. You know I love an audiobook when I want to buy physical copy of the book! But yes. There’s not much else to say but go! Go forth and enjoy.